The 8th International Summer School on Information Retrieval offered high quality teaching on Information Retrieval and related research topics to a broad audience of computer scientists and research students working on topics related to management of information on the Internet, as well as for industrialists who wish to know more about this highly important topic. Traditionally, ESSIR served a central meeting point for IR-oriented students and young researchers and, accordingly, an incubator for new ideas and paradigms. ESSIR is the only world-wide school in Information Retrieval. It's a scientific event with temporal regularity founded in 1990 which gave rise to a series of IR Summer Schools. ESSIR 2011 took place in Koblenz / Germany (Rhineland) in the week between 2011-08-29 and 2011-09-02. School participants were expected to have background knowledge in foundational Computer Science disciplines, at least at the Bachelor level in Informatics or related fields. Strongly recommended backgrounds included core courses in Linear Algebra, Stochastics and Theory of Probabilities, Graph Theory, Data Structures and Algorithms. Upon successful participation in ESSIR lectures, all participants received the written "Acknowledgement of participation" and/or the "Transcript of records" in ECTS format (European Credit Transfer and Accumulation System). Further information can be found in section Certification. Upon successful participation in ESSIR lectures, all participants received the written "Acknowledgement of participation", i.e. a confirmation that they have successfully attended the Summer School. Upon successful participation in ESSIR 2011 lectures, some participants received on request the "Transcript of records" in ECTS format (European Credit Transfer and Accumulation System, 3 credit points for the master course "Information Retrieval") from University of Koblenz. This option was only available for students currently enrolled in bachelor/master/diploma programs, the original proof of enrolment / matriculation from home university was required to be presented on site. The "Transcript of records" was issued in category Y (successful participation in all lectures, no examination) or with graded result A/B/C/D/E (after examination). Examination forms and success criteria have been announced during ESSIR 2011 and explained in detail to requesting students. We strongly recommended our student participants to ensure in advance with their home university whether the ECTS trancript of ESSIR'11 can be accepted and attributed as part of the respective participant's curriculum. Dr. Dr. Sergej Sizov (University of Koblenz, Germany) holds two PhD degrees, in Applied Mathematics (Technical University of St.-Petersburg, Russia) and Computer Science (University of Saarland, Germany). Sergej Sizov recently held positions as researcher, project leader and lecturer at the University of Saarland and the Max-Planck Institute for Computer Science, Germany. Currently he is working with the research group WeST (Institute for Web Science and Technologies) at the University of Koblenz, Germany. Sergej Sizov acts a General Chair of ESSIR 2011. Prof. Dr. Steffen Staab is leading the Institute for Web Science and Technologies WeST. Before his current position Prof. Staab held positions as researcher, project leader and lecturer at the University of Freiburg, the University of Stuttgart/Fraunhofer Institute IAO, the University of Karlsruhe and at Ontoprise GmbH. In his previous work, he has originally developed the concept of semantic portals, the notion of ontology learning and was among the first to consider emergent semantics as an important research domain. Steffen Staab acts a General Scientific Advisor of ESSIR 2011. Dr. Stefan Siersdorfer (L3S research centre, University of Hannover, Germany) holds PhD degree in Computer Science (University of Saarland, Germany). Stefan Siersdorfer recently held positions as researcher and project leader at the Max-Planck Institute for Computer Science, Germany, and in the department for Information Studies at the University of Sheffield (UK). His research interests include collaborative and meta methods for data organization, multimedia retrieval, and Web 2.0 IR. Stefan Siersdorfer acts a Symposium Chair of ESSIR 2011. Dr. Thomas Gottron (University of Koblenz, Germany) has been awarded a PhD in computer science from University of Mainz, Germany, in 2008. His research interests include analysis of Social Web communities, explicit semantic analysis of document collections, and predictive models for IR systems quality. Thomas Gottron acts a Program Co-Chair of ESSIR 2011. Everything you should know for trip planning! Venue - the most beautiful "corner" of Germany. Transportation - getting to Koblenz/Germany from everywhere, navigating through the city. Accommodation - we offer a number of suitable accommodation options in different price ranges. Travel Information - a couple of useful hints for your information. Leisure activities - learning where others spend their holidays !! Geocaching - geospatial retrieval in practice! Several geocaches will guide you to ESSIR places in Koblenz! The registration fees include participation in the Summer School and co-located PhD Symposiums, coffee breaks and lunches, poster reception, school materials, wireless internet access, and participation in the main social event (Rhine Loreley cruise with dinner). All payments shall be made by the Participant without set-off or deduction of any kind in Euro (EUR) using PayPal or wired transfer as instructed by the electronic registration service. The reception date of the full payment will be considered as the registration date. ESSIR'11 registrations can only take place through the electronic registration service, followed by payment of participation fees. By applying for participation through the electronic registration service, the applicant communicates their acceptance of ESSIR 2011 Terms and Conditions. Applications without immediate online payment will be considered as provisional applications. The reception date of the full payment will be considered as the registration date. Payments must be received within 10 working days after application and no later than 7 days before the starting day of the event. The participant cannot derive any rights from the provisional application. Cancellations or terminations occurring after the commencement date of the School for any reason will receive no refund of any participation fees. All refunds are less any foreign exchange or money transfer charges and any similar expenses incurred by ESSIR'11, plus a nominal management charge of 50 EUR. old town of Koblenz (small streets Gemüsegasse / Mehlgasse, see Map). 16.00-17:30: Plenary Discussion: PhD experiences and recommendations from ESSIR lecturers! All school participants are invited (and strongly encouraged) to bring a poster (portrait orientation, max size DIN A0) and present their research interests and current investigations in the poster session of ESSIR. This is an excellent opportunity to collect freindly feedback on own work from other students and from experienced researchers, including ESSIR lecturers! ESSIR lecturers speak about their PhD and academic experiences and discuss recommendations for a successful research career in IR and Computer Science with School students. The discussion is a dialogue - please come prepared and bring tricky questions to your lecturers! Social event: river cruise to the medieval castles of Rhine valley and the world-famous Loreley rock. Depending of weather conditions, we plan further informal social activities in the late afternoon of Monday and Tuesday. Currently we are planning an evening on the city beach (Statt Strand with beach volleyball) for Monday and a city tour on Tuesday. Short-term announcements will be published on the ESSIR Web site and in ESSIR Facebook group. ESSIR 2011 will address advertised learning expectations and content as far as possible. We ask participants to recognize that sometimes Summer School lecturers are prevented from attending for personal or business reasons. In such cases, ESSIR 2011 will endeavour to find suitable equal-quality replacements. In this connection, ESSIR 2011 reserves the right to appropriately adjust the School outline. Geospatial retrieval in practice! Conceptually, geocaching is a real-world outdoor treasure hunting game. Players try to locate hidden containers, called geocaches, using GPS devices and then share their experiences online. The impressive Geocaching Map of Koblenz shows over 100 caches, including many puzzles, adventures, and lost places - many of them in the direct vicinity of ESSIR. Students' nightlife: After your first days in Koblenz, you might be interested to try GC2JPJA - a tricky puzzle that is closely related to both University Campus and to student nightlife in Koblenz! The cache description is available in English. As a small spoiler, the final is somewehere just 5 min away from ESSIR lecture halls. From Campus to German Corner: There is a very nice panoramic footpath along the Moselle river from University Campus to the most famous place of Koblenz, the German Corner (aka Teutonic Knights corner), confluence of rivers Moselle and Rhine. The walk takes 30-40 min. Our GPX Track can guide you! Some segments of the footpath are quite new and may not appear on older maps. On the footpath, you will direcly pass geocaches GC2VMMC (puzzle), GC2B1EG (traditional) and GC2JDA9 (traditional). At the end of your walk, you can try the traditional cache GC228YX directly at the German Corner! Fans of T5 adventures and lost places might be interested to try GCWZMD, GC16T4B or GC1M83W - gallery photos speak volumes. It's worth the translation for some German descriptions, we will be glad to assist you. Working where others spend their holidays !! A MUST: Rhine cruise to the magnificent Rhine valley at the Loreley - Unesco World Heritage with wineyards, numerous medieval castles, and Rhine of course. The ESSIR social program will include the Loreley boat trip! Furthermore, Koblenz Touristik provides nice tour recommendations and a detailed overview of shipping lines. Castle of Marksburg in Braubach close to Koblenz, is the most famous medieval castle of the Rhine valley which has never been destroyed (unlike many others). Rhine and Moselle are famous for excellent wines, especially white Riesling. Small villages and towns along the river valleys offer numerous opportunities for wine tasting. Avoid central, large restaurants (full of Japanese tourists) and have a lookout for a besom on the wall of a small wine-grower shop - it shows that his small wine pub is open! It is often called "Besenwirtschaft" or "Strausswirtschaft". Rhineland has the best infrastructure in Germany! Many ideas and tour suggestions for the surroundings of Koblenz can be found at portals Traumpfade and Radwanderland. These sites are mostly in German, so do not hesitate to ask us if you are interested and need some help! Koblenz Touristik provides addresses of local bike rental shops and some tour recommendations. A nice sand beach Statt Strand is situated on the Moselle river, right in front of the University campus!! You will find tons of sand, beach volleyball, summer feelings, and very good beach cocktails just 5 min away from your lecture hall!! The world-largest cold geyser in Andernach near Koblenz. Trip includes the visit to the interactive geyser museum, a short boat trip on the Rhine to the near nature reserve where the geyser is situated, and of course a geyser eruption (50- 60m high !!!). Volcano museum "Lava-Dome" in Mendig near Koblenz. We are situated in the area of high volcanic activity (hotspot area) which results in numerous volcanoes, volcanic seas, lava streams, and sometimes also perceptible earthquakes!! The trip includes a visit to the interactive museum, guided tour with descent into lava mine, and explanations of old stonemason handicraft in Rhineland that origins from Roman times. Guided Segway tours across Koblenz are offered by Biwakschachtel, the shop is located close to main station. 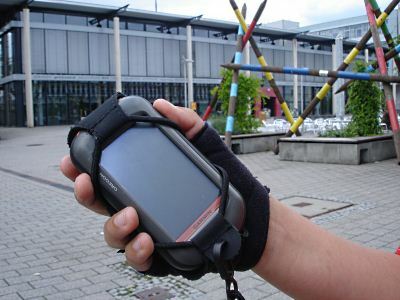 Geocaching will guide you to many local attractions and beautiful places in Koblenz. Fans of T5 adventures and lost places might be interested to try GCWZMD, GC16T4B or GC1M83W - gallery photos speak volumes. It's worth the translation for some German descriptions, we will be glad to assist you. Climbing: Via Ferrata Boppard close to Koblenz offers alpine feelings on the rocks of the Rhine valley. Can be combined with nice walks in the surrounding hills. Equipment can be borrowed nearby, in the ARAL gasoline station at the main road B9. Detailed maps and track for the walk can be found here. A nice high-rope parcours in the woods is installed in Kletterwald Sayn close to Koblenz. Panoramic flights with Rhein-Mosel-Flug (RMF) from the airfield Winningen close to Koblenz. You will enjoy the valleys of Rhine and Moselle in a very special and unique manner. Can be combined with a nice walk through slate vineyards down to the Moselle - the village of Winningen is one of the most beautiful winegrower villages in all Germany. For more action, RMF also owns two professional aerobatic machines. Aerobatics with an open biplane is fun! In summer 2011, Koblenz hosts the prestigious German horticultural show. ESSIR 2011 benefits from advanced tourism infrastructure and additional attractions (e.g. a new panoramic cable car over the Rhine, restored historical buildings, various installations, and rich cultural program). Learn about Web Retrieval and IR in the Cloud from head of Yahoo! Research Barcelona and author of the famous schoolbook "Modern Information Retrieval"!! Learn about foundational models and methods in IR from author of the famous books "Introduction to Information Retrieval" and "Foundations of Statistical Natural Language Processing" (the "Manning-Schütze" math bible for computer scientists)!! Learn about human aspects in IR and evaluation from author of the recent book "The Turn: Integration of Information Seeking and Retrieval in Context"!! Learn about Multimedia IR from author of the recent schoolbook "Multimedia Information Retrieval"!! Learn about recent challenges of Web Science from co-founder of the Web Science Trust foundation! Learn about Graph Theory and Network Analysis from "godfather" of Pajek - the famous large-scale network analysis package!! Learn about Retrieval in Social Media from "godfather" of Bibsonomy - a popular Web 2.0 platform for social bookmark/publication sharing!! Learn about Semantic Search from co-founder of the SemSearch workshop and one of the leading researchers in this field. After having 31 students talk to each other for 3 minutes and write down some key words after each 3 minutes, this is the resulting tag cloud and shows what is hot at the moment in IR. The 4th Symposium on Future Directions in Information Access (FDIA) will be held in conjunction with the European Summer School in Information Retrieval in Koblenz, Germany. The symposium aims to provide a forum for participants of the summer school to share their research and interaction with senior researchers in an informal and relaxed atmosphere. The previous symposiums were held in Padova, Italy in 2009 (with ESSIR 2009), London, England in 2008, and Glasgow, Scotland in 2007 (with ESSIR 2007) and have provided an entertaining and exciting forum for sharing and forming tentative ideas and work. Why future directions, because we want to encourage submissions that focus on the early research such as pilot studies, presenting challenges and future opportunities, conceptual and theoretical work, and the contributions from doctoral work. Why Information Access, because it captures the broader ideas of information retrieval, storage and management to include interaction and usage. This symposium calls for research papers to be submitted on topics about Information Access. We especially encourage submissions on late breaking and formative research which presents initial work that survey and present future challenges and opportunities, present pilot studies, explore conceptual and/or theoretical models, or which present results, findings and future directions on experiments conducted using an existing approach in a new space or on a new collection. Submissions focusing on new directions and emerging work in Information Access/Retrieval which create discussion and provoke reaction are strongly encouraged. Submissions should provide the necessary background and motivation of the topic, so as to maximize the benefit to the author and fellow participants. All papers will be peer reviewed by at least one senior researchers on the Programme Committee. Papers should be 4-6 pages in length in eWics Format using the Word or Latex templates. Submissions should be converted to PDF. All submissions must be from a solo author: the idea is to encourage and promote one's own research. We would also like to invite shorter submissions which provide a summary of the your current research to present as a poster during the symposium. This is an excellent opportunity to discuss your research with your peers and senior IR researchers and practitioners during FDIA / ESSIR. All posters will be reviewed. Poster paperss should be 1-2 pages in length in eWics Format eWics Format using the Word or Latex templates. Submissions should be converted to PDF. This symposium will address diversity and bias of content from a multitude of users and information sources on the Web. In this context, we will discuss methodologies and applications for diversification of search results as well as combining and extracting information from multiple sources. To this end, we will present and discuss innovative methods in NLP, multimedia analysis, search technology, and opinion mining that enable bias-aware and diversity-aware information access technology for the Web. The symposium is intended for a broad range of students, researchers, and IR practitioners interested in and dealing with diversity of content occurring in Web search results, on the Social Web, or in blogs. The Web and especially the Social Web lives from the multitude of actors that are involved in content creation. It has achieved a democratization of content production that potentially gives a voice to everybody. However, today's search technology fails to reflect this variety in an explicit and structured way. For controversially discussed topics such as "global warming" the content available on the Web reflects the full variety of positions and their evolution over time. However, due to the sheer mass of available content and the way content is ranked by current search technology (mainly based on relevance and popularity) it is difficult to get a structured diversity overview. In addition, content is partly strongly biased without making the underlying intention explicit. A better overview over existing opinions - and support in discovering bias and analysing the underlying diversity (driven by differences in cultural backgrounds, schools of thoughts, temporal context etc.) - clearly helps in building an own opinion in a well-informed way and in reflecting and contextualizing own positions. We will present leading edge technology that can help making diversity a real and tangible asset of the Web. Organizationally, the day will combine tutorial style parts given by experts in the field, a high level of interactivity with the audience and hands-on style parts that give the audience the opportunity to gather deep technical knowledge and first-hand experience in building bias- and diversity-aware technology for next-generation services on the Web. This session will be split into two parts: The first part will deal with methods and technologies for discovering opinions from different types of Web content. The second part will deal with discovering entity evolution and temporal facts. Discovering opinions articulated in Web content is one of the cornerstones of dealing in a systematic way with diversity on the Web. This part of the session will give an introduction into state-of-the-art technology in opinion mining and sentiment analysis, and will also look into more in depth analysis methods for opinion mining. The constantly evolving Web reflects the evolution of society in the cyberspace. Web collections contain knowledge about entities (people, companies, political parties, etc.) as of a certain time point. Within the tutorial we will present approaches that allow discovering entity evolution and associating them with the appropriate temporal fact(s). To this end, we will first introduce and compare approaches for temporal fact extraction from factual knowledge sources such as Wikipedia. After that, we will present strategies to resolve ambiguous names and map them onto the right entity in order to trace their evolution. Documents on the Web increasingly use images and other non-textual materials to convey additional information or enhance the content in some way. The tutorial will (also) explore how multimedia content analysis using recent tools from research in image processing and computer vision can be coupled with textual information extraction and used to enhance web search in a variety of ways. The use of these tools to support diversity in both querying and result presentation will be covered together with approaches to sentiment analysis in images and other emerging multimedia techniques. The goal of this practical session is to put the theory discussed in the previous sessions into action. We will start with an introduction to the testbed developed in the EU FET Project LivingKnowledge, which is a development platform supporting bias and diversity aware search. The testbed integrates the technologies developed in the project, and a framework for adding and evaluating new bias and diversity aware components as well as using the integrated components to support bias and diversity aware applications. In the hands on session, we will use the testbed to create a baseline application. We will then walk through a real example of integrating an opinion extractor into the application including adding the extractor to a document analysis pipeline, evaluating the performance of the extractor, indexing and searching on the output of the extractor, and finally integrating the output into the baseline application. Time permitting we will perform the same steps for an image analysis tool. DIV-2011 is supported and organized by the EU FET Project LivingKnowledge. Koblenz has a very central position in central Europe and in Germany. The ESSIR location can be easily reached by plane (including many low-cost airlines, such as Ryanair, Germanwings, Air Berlin, easyJet), by train (the majority of international long-distance trains in Germany pass through the Rhine valley and Koblenz), and by car (three highways, part of the European highway network). Airport Frankfurt International (FRA): Major international airport about 115 km from Koblenz. All international airlines. Many direct trains to Koblenz, travel time app. 70 min (25 EUR), car ride from the airport app. 60 min. Airport Cologne-Bonn (CGN): International airport about 100 km from Koblenz, major hub of low-cost airlines Germanwings and AirBerlin. Excellent connection to Koblenz by direct trains, travel time 60 min (14 EUR) car ride from the airport app. 60 min. Airport Frankfurt Hahn (HHN): International airport 65 km from Koblenz, major Ryan Air hub in Europe. Direct coach link to Koblenz, travel time 70 min (15 EUR) or by car, travel time 40 min. Airport Dusseldorf International (DUS): International airport 130 km from Koblenz. Many international airlines. Many direct trains to Koblenz, travel time app. 90-120 min (23 EUR), car ride from the airport app. 75 min. Deutsche Bahn (German Railways): Koblenz is located at the IC/EC track that connects the major cities from north to south in Germany. Many international long-distance trains (including EuroCityNight) to Cologne, Frankfurt, Hannover, Hamburg pass through Koblenz. Direct trains to the airports Frankfurt, Frankfurt-Hahn, Cologne-Bonn, Dusseldorf are available. A dedicated bus link (Bus #20) connects the main station with university campus (15 min). Use the journey planner of German railways with destination "Koblenz HBF" (Koblenz main station). It is possible to buy tickets online. From Koblenz main station, you can take a bus or taxi to your hotel/hostel or to the Campus. The taxi rank and the large bus station are located in front of the main entrance. For GPS navigation, please use the following target address: 56070 Koblenz, intersection Oberweiher - Universitätsstrasse (50.362318,7.557238). This will bring you to the main entry of the campus. Parking lots can be found in front of the main entry on the right (small), the way down to the Moselle river on the left side (large) and also - just few steps away - under the big Moselle bridge (large). Just follow the corresponding signs for parking. All parking lots are free of charge. The taxi from the city centre or the train station to the ESSIR venue (8-9 min) costs app. 10 EUR. We recommend to explicitly ask for 'University Campus Metternich' (Metternich is a district of Koblenz). Many years ago, the Campus was located on the opposite side of the city, and some mature taxi drivers may mix up destinations. Taking a bus from the city centre or from the train station to the ESSIR venue (University campus) takes 12-15 minutes and costs 2,45 EUR for a single journey. A variety of special fares (e.g. 1-day ticket, group ticket for 5 people) are also available. Buses to/from the campus are: #3 (from city center), #15 (from main station/city center) and #20 (from main station, this is the fastest link). Complete Timetables (Campus bus stops are "Winninger Strasse" or "Oberweiher/Uni"). Please consult Interactive Map, Google Maps for detailed information about available bus stops. In many cases, non-EU nationals are required to obtain the entry permission (Schengen Visa) for Germany. Please consult the advices of the German Federal Foreign Office for further information regarding your country and visa requirements. School participants that are required to obtain an entry permission before entering Germany, can be provided with ESSIR reference letters for respective German missions. We ask for your understanding that reference letters can only be issued after registration and payment of ESSIR participation fees (no exceptions). Please take into account that August/September is also holiday time. We recommended to check the application processing times at the responsible German mission, and to submit yor visa application in good time before ESSIR starts. Germany is located in the CET/CEST time zone (UTC+1/+2). This means in the week of ESSIR we will have UTC/GMT +2 hours. For more information, look at timeanddate.com. The German currency is Euro (EUR). Currency exchange desks can be found at all international airports. Lokal bank offices offer currency exchange as well (for safety reasons, they reluctantly exchange big amounts of cash). ATM machines offer cash withdawal by credit cards and Maestro (in almost the cases this service is not free of charge, you should ask your bank about cash withdrawal fees). To estimate exchange rates, play around with Yahoo! currency converter. A full-featured ATM service can be found in a small "Sparkasse"-house at the main Campus entry. Larger shops and restaurants accept all major credit cards and Maestro as well. Common supermarkets (Aldi, Lidl, Rewe, Norma, Plus) accept Maestro but NOT credit cards. Small shops and pubs may have no electronic payment facilities on site. Tip is accepted but not mandatory, 10% is the common value. Travel cheques are not really common and not widely accepted. Visitors from non-EC countries can benefit from Tax-Free Shopping in Germany. Koblenz Touristik provides a very detailed and well structured Web portal for Koblenz visitors. Highly recommended! German mains power system offers 230 V 50 Hz AC, common outlets (i.e. plugs and sockets) are SchuKo (symmetrical plug with side grounding contacts), sometimes also the simpler Europlug (2-pin plug without grounding contacts). Travel stores at all airports and local electronics stores in Koblenz (e.g. MediaMarkt, Saturn, Expert, ProMarkt) offer a broad range of adaptors at reasonable prices. Devices designed for lower voltage levels (e.g. 110V hairdryers) also require a suitable upstream transformer! Major telecommunication providers in Germany are German Telekom and Vodafone (900 MHz) as well as O2 and E-Plus (1800 MHz). It is recommended to check in advance the roaming conditions for in/out mobile calls. Possible alternatives are Skype/VoIP and callback services (e.g. Bellshare, flat2flat, Flexsys, Sparruf, to name a few). In parallel, the network of public telephone stations is shrinking - at the moment, there is no public telephone box on the Campus. Mobile internet via UMTS (WWAN aka 3G) has already reasonably good support in Koblenz, Vodafone D2 seems to have the best coverage. Stable HSDPA is available in the city center, EDGE almost everywhere. It is recommended to check in advance your data roaming conditions, many providers do not support roaming at high HSDPA speeds, and volume prices are also quite different. The Campus offers dedicated W-Lan access vor visitors, which will be available for ESSIR participants on request, free of charge. As an alternative, you also can authenticate your W-Lan access via Eduroam, which is fully supported in our University. The bakery and coffee shop "Hoefer" in front of the Campus offers its own W-Lan access for free (!). Wired internet will be available in lecture halls. There is no public post office and no letter box on the campus. However, there is a full-service Retail Outlet in the REWE shop nearby. The supermarkets REWE, Norma, Edeka and Aldi are located next to the Campus. A big shopping mall "Löhr Centre" can be found in the city center, it is co-located with main bus interchange. A huge (one of the largest in Germany) shopping areal with numerous outlets and stores is located in Mülheim-Kärlich near Koblenz. To get there, take the regional Bus #357 from one of the central bus stops in the city (consult VRM Web site for bus stops, timetables and fares). In this case, don't miss also a nice public swimming pool Tauris nearby (Bus #354). Koblenz Touristik provides further shopping ideas in and around Koblenz. ESSIR offers full access for disabled attendees on the entire campus: elevators in all buildings, stairs-free pathways and ramps, dedicated restroom facilities. On request, people with disabilities can access the Campus by car and use dedicated parking lots directly in front of particular buildings. Koblenz operates only low-floor buses with improved disabled access, dedicated places for wheelchairs, and call buttons for boarding assistance. Deutsche Bahn (German Railways) offers systematic and comprehensive support for passengers with disabilities. In Germany, smoking is not permitted in public rooms (including all Campus facilities, city shops, restaurants and pubs, with quite few exceptions). Smoking is also quite expensive: one cigarette packet costs 4.50 EUR and taxes are expected to grow further in near future. Cigarette vending machines can be found in front of the campus entrance (age verification by Maestro chipcard of by driver license), you may also buy cigarettes in kiosks, petrol stations and some shops around, but NOT on the Campus. Koblenz combines the advantage of an established tourism destination (with many accommodation facilities of different price and comfort levels) with the charm and modest prices of a small town. The early registration and accommodation request(s) will not affect the success of your eventual grant/student grant application for the Summer School! The summer school management has arranged reserved pools of rooms in several city hotels (in different price categories), all with very good reachability from the ESSIR venue (by bus or a short walk distance). Hotel reservations are managed by Koblenz-Kongress, accommodation requests should use the following interactive PDF form. In any questions to Koblenz-Kongress, please explicitly refer to "ESSIR 2011" as target event. The accommodation reservation form should be sent to the Koblenz-Kongress contact point no later than 18 July 2011. Room booking will occur on a first come first serve principle, the choice of a particular hotel, room type or price category cannot be guaranteed. Koblenz - Germany's most beautiful "corner"
Koblenz is a wonderful old Roman town with modern infrastructure and a young spirit. The University of Koblenz offers a fully equipped modern campus with comprehensive congress facilities, convenient hotels nearby, surrounded by a beautiful, UNESCO world heritage landscape of the Rhine valley, historical attractions like medieval Rhine castles, and a convenient infrastructure for travel from all over the world, including four international airports, excellent railway connections, and several highways. Koblenz is situated in the picturesque landscape of the Rhine and Moselle (UNESCO world heritage), known for excellent wines, romantic medieval castles, Loreley and Goethe. The town owes its name to the Romans who named the castle "castellum apud confluentes" - this means "castle at the confluence of the rivers". A variety of cultural offers (sightseeing, museums, boat trips on Rhine and Moselle), outdoor activities (hiking, bike tours) and a certain portion of nightlife with several attractive locations in the historical city centre make Koblenz an ideal location for our summer school. Take your time for reading further infos about Leisure activities; this list is quite long!! Due to a favourable geographic location (Rhine valley, surrounded by low mountain ranges of Westerwald, Eifel, and Hunsrueck), Koblenz is also known for very good weather conditions all over the year. In order to make use of the granted support, the successful applicant must register to ESSIR 2011 (including payment of participation fees) and successfully attend the entire School program. Detailed instructions on grant claiming will be sent to successful applicants together with grant notification. Please check the web page and Webmaster corner the detailed contact information. Besuchen die Sie -Seite und die Webmaster-Ecke für detaillierte Kontaktinformationen. EN: The contents of this Web site have been carefully checked. However, we cannot guarantee the absolute correctnes, completeness, and recency of all informations provided. We do not have any control over external linked Web sources. Insofar, we cannot ensure the liability of them, especially there is no guarantee that the external contents is correct and up to date. The views expressed on external Web sites are purely those of the respetive writer or content provider and may not in any circumstances be regarded as stating an official position of the Institute for Web Science and Technologies. DE: Trotz sorgfältiger Prüfung übernehmen wir keine Garantie, dass die Angaben auf dieser Webseite vollständig, korrekt und aktuell sind. Die Inhalte der externen Webportale, die von unseren Seiten ggf. verlinkt werden, liegen ausserhalb unseres Einflusses. Die Korrektheit und Aktualität der extern verlinkten Inhalte kann nicht garantiert werden. Informationen, die dort angeboten werden, haben keinerlei Verbindung zu den Inhalten unserer Webseite ESSIR'11. Meinungen und aussagen externen Web-Quellen können unter keinen Umständen als offizielle Position des Instituts für Web Science und Technologien oder dessen Mitarbeiter gewertet werden. The content is HTML 4.1 / CSS level 2.1 compliant and has been checked with W3C link checker, W3C CSS validator, and W3C HTML Validator in HTML 4.01 Transitional mode. 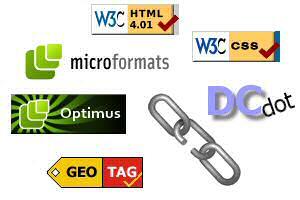 Integrated microformats have been checked with hCard Validator, Optimus validator, and Google Rich Snippets Testing Tool. All published Web pages have been systematically tested with Firefox 3.6 and Internet Explorer 8 and checked on BrowserShots.org for appearance in other browsers. The site performance has been tested in WebPageTest in line with Yahoo Best Practices for speeding up Web sites. The robot access has been verified with robots.txt checker. The robot sitemap is generated with XML Sitemap Generator. The site is regularly monitored with webmaster tools of Google, Yahoo, and Bing. If you experience any problems viewing our site in your particular browser, please let us know. The initial prototype design of this Web site has been adopted from Free CSS Templates under the Creative Commons Attribution license. Panoramic views of Koblenz are kindly provided by the Koblenz Tourism Office: Copyright © Koblenz-Touristik. The webcam service is kindly provided by the German Federal Institute of Hydrology with suport by the Administration "Burgen-Schlösser-Altertümer" of Rhineland-Palatinate and by the Landesmuseum Koblenz.